Illustration of various epics and legends took a big place in the work of Ivan Bilibin. “Illustration for the Volga Boar” is written in an ornamental style with elements of decor based on the motives of Russian legends. Ivan Bilibin in his works developed a special style based on ornaments and patterns of ancient Russia. For example, in this work the shield, the horse harness and the clothes of the hero struck with ornamental wealth. A whole army of Russian soldiers appears before the spectator’s eyes. As in the epics and legends, in this picture the figures of the soldiers are subject to the great influence of idealization – the same growth, with eyes full of courage. Ivan Bilibin very often turned to the theme of the Russian people, describing the peasants with special love. Great importance in his works the artist devotes to the Russian land, its expanses, fields, bread, which grows on them. 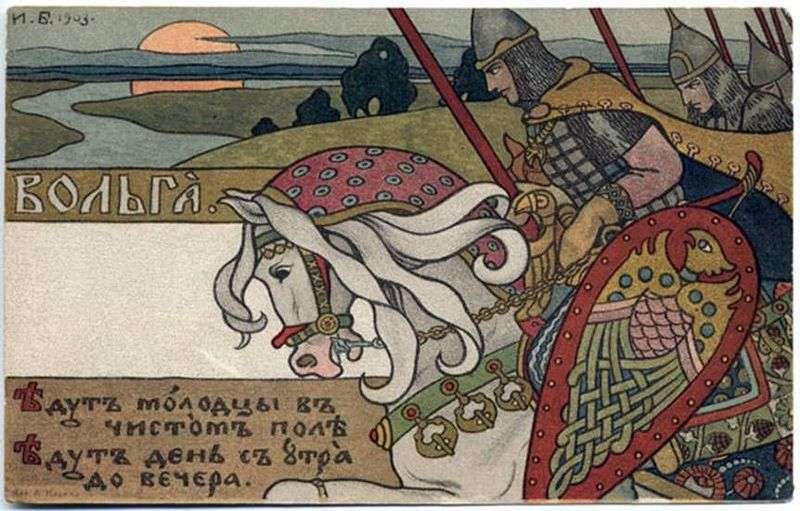 Description and meaning of the painting Wolga by Ivan Bilibin.